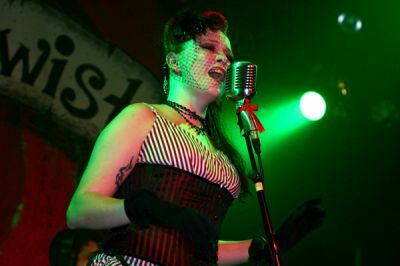 On Oct. 30, Water Street Music Hall in Rochester, NY hosted the Devil's Night Fetish Masquerade. Thank god for Tranquilatwist, a Rochester based trip-hop band that saved the night. Fronted by Karlie Cary Lanni, who managed to instantly captivate the audience with vocals as big as her smile, she belted out tunes from their new album Down About the Ceiling. Karlie first took the stage in Elvis-like fashion as the photographers jammed the stage to get their shots. People were screaming, "I love you, Karlie!" This was essential in fueling the band's energy the entire set. The outcome was a performance that instantly has thrust them into the hierarchy of the local scene.